GARY OLIVER will stay at Hearts while head coach Robbie Neilson decides whether to send him on loan. The 20-year-old striker has been impressive during pre-season and may be needed if Soufian El Hassnaoui’s latest injury rules him out for several weeks. The Dutchman left the field minutes before the end of Saturday’s friendly at Preston after twisting his knee. Medical staff at Riccarton will assess the problem before deciding whether to send the player for a scan. Oliver’s immediate future may depend on the outcome. Neilson explained that any decision will be taken with Oliver’s development the main priority. 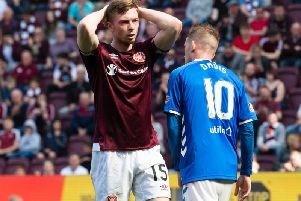 He spent time on loan at Stenhousemuir last season but was recalled when Hearts suffered an injury crisis amongst their strikers during the winter. With El Hassnaoui struggling and new signing Juanma absent due to a minor groin injury, Oliver will sense the chance to impress ahead of the new season. “Gary will stay at the moment,” Neilson told the Evening News. “I spoke to Gary a few weeks back and the plan was to put him out on loan but he’s doing really well. It’s a difficult one to balance off. If I keep him here. He gives us options but it’s whether that hinders his long-term development. “If he’s going to stay for this season then he needs to get game time. If he isn’t going to get that, then we need to get him playing at a really good level. He should probably be playing in the Championship this year at the very least. If we can get that for him then I might look at it.